In an atmosphere of nationalistic brainwashing and blind subservience to an ideology that is taking this country down the path of socio-cultural regression, the documentary Building Bridges comes as a respite from political propaganda that imbues one’s countrymen with hatred towards another nation. First time filmmaker Rahul Chandawarkar brings us an image of Pakistan that is vibrant, hospitable and culturally exuberant. It presents a Pakistan that could have emerged as a progressive nation had it not been strapped down and shackled by the effects of Talibanisation. The decision to document this journey was made just before leaving with a hurried purchase of a Sony handycam which was made functional through trial and error. The 45 minute film is grainy and shaky almost throughout its length, but it lends authenticity to the images captured. Though filmed in 2004 it was only in 2012, after years of discussion, that Mihir Apte, a film editor and a friend of Rahul, edited the footage to create a documentary. Director Rahul, who is notably the erstwhile editor of Sakal Times, Pune, displayed considerable perseverance in recording this momentous trip, as he had rightly assumed it would be. The catchy and fitting background score of the Pakistani band Strings reveals a perfect amalgamation of the artistry of the two countries. Together with Mihir’s skills as a film editor, the two men have turned out a gem of a documentary that has won the appreciation of none other than National Award winning director Shyam Benegal and theatre personality Sanjna Kapoor. It was the year 2004 when Rahul journeyed to Lahore as co-ordinator and part of the cast of an Urdu theatre troupe headed for the World Performing Arts Festival. The theatre group had been invited to the festival by the Rafi Peer Theatre Workshop, who were the organisers of the festival, thanks to an introduction by Lahore based journalist Rina Khan. The Urdu play they had chosen to do was set in Post Partition Lahore and depicts the life of a Punjabi Hindu woman in a Muslim state in the throes of animosity. A Muslim family, which has moved from Lucknow to Lahore, is given possession of the home of the Hindu woman called Maee who has lost her relatives in the riots. There is turmoil over ownership of the house but in the end Maee has the support of the other people around her. The play was Jis Lahore Nahin Dekhiya, written by Asghar Wajahat, a Hindi scholar and writer. The 12 member theatre group, which included Hindus as well as Muslim artists, believed that this play would have a positive impact on relations between the two countries that have been perpetually at loggerheads since 1947, or at least stretch a hand of brotherhood to the common Pakistani person. The theatre troupe made its journey on board the Samjhauta Express, which means ‘compromise’ or ‘accord’. The play was staged at the World Performing Arts Festival along with performances by Junoon, Strings and Rahat Fateh Ali Khan, and drew applause and commendation, as well as open concurrence with the ideas of harmony and peace projected through it. It was, however, the warmth and generosity of the people of Lahore that touched the members of the troupe, as Rahul recounts in the documentary the story of a Pakistani man who refused to take any money for the work he was commissioned, stating that they were guests in Pakistan. The university students they met with had a humanitarian approach to bridging the divide between the two countries. There is a certain amount of levity in Rahul’s commentary as he describes the posturing of the soldiers on either side during the Beating Retreat ceremony at the Wagah border, which was witnessed by them from the Pakistani side for the first time. One of the more amusing and culturally significant anecdotes in the film is that of Rahul waving both the Indian and the Pakistani flag at a hockey match between India and Pakistan. It earned him some notoriety in the Pakistani media with a photograph as evidence. He was mistaken for a Pakistani man owing to his beard and garb of salwaar khameez, which just goes to show that we are not all that different from our neighbours. Rahul returned to Pakistan with a smaller cast and another play the following year to very much the same experience. ‘There are many perspectives. This is my perspective,’ says Rahul in response to scepticism about the goodwill of Pakistanis. ‘There is no doubt that they are having problems…they’ve killed a Sikh leader from Imran Khan’s party, the killing of the little children from Peshawar and the Christians on Easter day. So they are having a lot of problems. Maybe more problems than us. This is my perspective as a visiting theatre artist and a journalist where I tried to document what we saw and what we felt… To tell you honestly, the people on the ground are like you and me’. Rahul believes that many of the issues Pakistan is facing are due to the skewed spread of education where a few are highly qualified and the majority have little or no education. It was a different time, a time that might have perhaps seen the healing of international relationships and the soothing of age old wounds. Even the World Performing Arts Festival has not been spared the ire of extremists as it was bombed in 2008. Building Bridges nonetheless reminds us that, despite the play of politics and fundamentalist terrorism, underneath it all, we are human beings capable of empathy and a love that can erase borders and dissolve gaps. And as long as we keep looking for these attributes within us and others, there is hope for humanity. 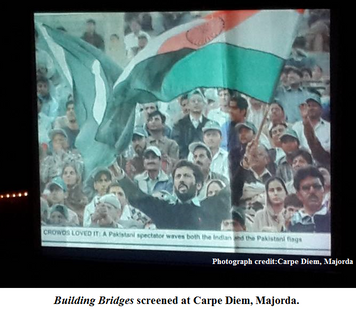  *The documentary Building Bridges was recently screened at Carpe Diem, Majorda, and People Tree, 6 Assagao.